Radon is a lung cancer-causing radioactive gas identified by the EPA as the second leading cause of lung cancer in the United States. It is an odorless, tasteless and invisible gas produced by the decay of naturally occurring uranium in soil, rock and water. It typically moves up through the ground to the air above and into your home through cracks and other holes in the foundation. Your home traps radon inside, where it can build up. Any home may have a radon problem. This means new and old homes, well-sealed and drafty homes and homes with our without basements. Around 50% of the homes in St. Croix and surrounding counties have radon levels of 4 pCi/L and above. The EPA recommends that those homes be treated with a radon mitigation system. The United States Environment Protection Agency (EPA) estimates that about 21,000 lung cancer deaths each year in the U.S. are radon related. The U.S. Surgeon General and the EPA recommend that all homes be tested for radon levels. Overall, radon is the second leading cause of lung cancer. Radon is the number one cause of lung cancer among non-smokers, according to the EPA. At a level of 10pCi/L it is like smoking a pack of cigarettes a day. For smokers, the risk of lung cancer is significant due to the synergistic effects of radon and smoking. At 4 pCi/L, 62 people in a 1,000 who are smokers will die of lung cancer, compared to 7.3 people in 1,000 for someone who has never smoked. Radon exposure does not produce immediate symptoms. You may not realize that you are being exposed to dangerous levels of radon until you or someone in your family is diagnosed with lung cancer. Langer Construction/Radon Testing and Mitigation is NEHA/NRPP certified, licensed and insured. We accurately measure radon and professionally install radon mitigation systems according to the latest EPA Radon Mitigation Standards. All of our work and materials are guaranteed for 5 years and is transferable. We are proud of our excellent customer service and timely response to radon test requests as well as quick turnaround on installing your mitigation system. We service Western Wisconsin and Eastern Minnesota. Mike is a native of Hudson, WI and has been a resident of St. Croix County for over 40 years. He is a trusted carpenter and contractor and has been a local business owner for over 15 years. Mike is very dedicated and is available to answer any questions or concerns. He is involved with overseeing and performing the installs and inspections. Brent has a background in carpentry along with several years of sales experience. He will educate you on what radon is, answer all of your questions, provide you with an estimate, and conduct the follow-up tests. Learn more about our Testing and Mitigation services here. For additional resources to learn about radon, visit our Resources page. My husband and I are hugely grateful to Mike Langer and company for their radon mitigation work in our home. It is not an exaggeration to say that Mike’s work to reduce our radon exposure may have saved my life. In 2016, on the advice of a doctor, we had our radon level checked, first using a mail in kit, then with a home meter we purchased. We learned that, at its worst, our indoor radon levels were four times the EPA’s stated “danger” limit. I have suffered a host of medical problems over the 12 years we’ve lived in our home. Some of these conditions are directly life threatening. When we learned of our high radon level, I did a great deal of research on the health effects radon exposure. (I have a PhD-level medical research education, so I was able to dig deeply into this topic.) I found that my medical history precisely fitted the types of illnesses, and the timeline for their development, exhibited by patients with Chronic Low Dose Radiation Syndrome. It became clear that fixing our home radon problem was truly a life or death situation for me. 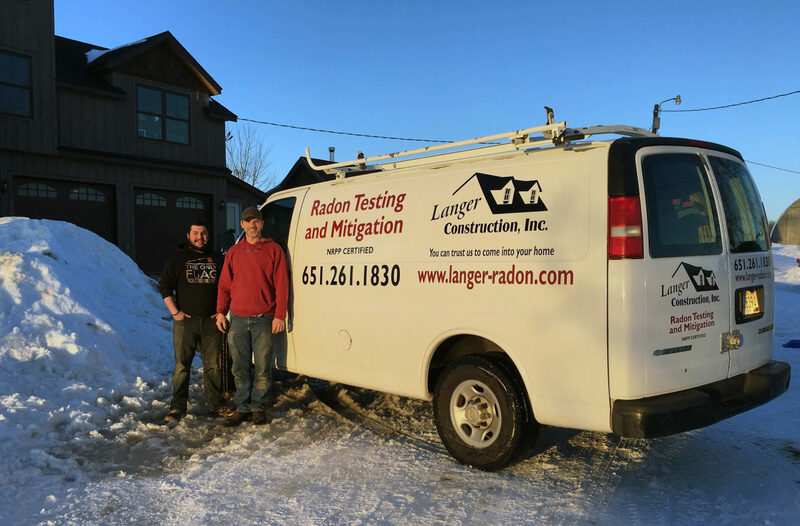 A friend had used Langer Radon Mitigation Services and rated them highly, so we chose to work with Mike and his team. We are so glad we did! Every radon mitigation situation is unique, since every building and the land/environment where it sits is unique. Our house proved to be a complex challenge for Mike, but he never gave up! We have an apparently very complicated foundation sitting atop a large, windy, hilltop lot filled with limestone. It took several months and numerous suction points to ultimately solve our problem. It was a frustrating process at times, but we had confidence in Mike’s ability and experience. It was clear that he was genuinely compassionate about my medical situation, and he really wanted to tame that radon beast for us. He approached the modifications to our home scientifically and patiently, step by step, until his persistence ultimately paid off. Our daily radon levels have now stabilized at background outdoor levels, with only an occasional foray above that. We couldn’t ask for a better outcome! We wholeheartedly recommend Langer Radon Mitigation Services with gratitude and enthusiasm. Thanks to Mike and team, I hope to be around to enjoy our dream home for many, many more years! We would love the opportunity to talk to you about radon. Please contact us to learn more about radon or schedule a test. If a test has already been done and you are in need of mitigation, let us know and we will get you a quote!